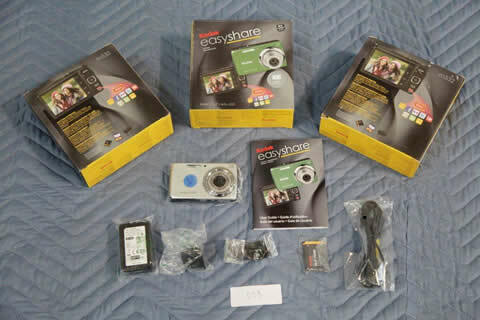 This upcoming online auction is for a lot of 3 Kodak Cameras. These cameras can be yours when you want to win something cool for the holidays. This auction will not last forever but it also doesn’t start for a few days, which means that you have a limited amount of time to check out the items and then bid on them at your own leisure. Kodak is a brand that has been around for a very long time. They are synonymous with sharing memories and taking great pictures. Kodak is a household name and when you get a look at these cameras all ripe for the picking then you will understand why they have been around for generations. These cameras all look like they are in new condition and come with their original boxes. You can do a lot with these if you just check them out now in your free trial. This current online auction is for a Large Lot Of Cameras, Lenses, Binoculars. This lot of photographic electronics would be of great use to someone who has that specific eye for detail. These cameras come in a large quantity as well as these extremely dynamic lenses. Remember, in a lot of cases the lenses are more expensive than the camera itself. This lot also comes with a few binoculars. If we didn’t know any better we would say that this lot was designed specifically for nature observing. This lot would be perfect for that budding photographer or that established pro. This is a great way to expand your art form to the next level and enjoy more intake of your surroundings. The current bid is only $825 with the auction ending soon. Find out more by activating your free trial! Various Cameras and Lenses: Get Clickin’! Smile! This Auction Will Have You Saying “Cheese”!